CHARLOTTESVILLE, Va. – Miami (24-12, 9-8 ACC) clinched the three-game Atlantic Coast Conference series with a 2-1 victory over Virginia (21-15, 8-9 ACC) in the nightcap of a doubleheader on Saturday (April 13) at Disharoon Park. The Hurricanes erased an early deficit in game one in a 9-6 win. The series finale is scheduled for 1 p.m. on Sunday (April 14). 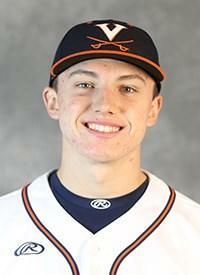 Freshman Mike Vasil will be on the hill for the Cavaliers and will be opposed by righthander Brian Van Belle. Virginia scored two runs on four hits to jump out to an initial 2-0 advantage in the bottom of the second. Nate Eikhoff (Bristow, Va.) plated the game's first run with a sacrifice fly that scored Cameron Simmons (Royersford, Pa.). Senior Jack Weiller (Katonah, N.Y.) followed up with an RBI single through the right side that scored Zack Gelof (Cape Henlopen). Miami responded with what proved to be a game-changing rally in their next turn at bat. The Hurricanes sent nine batters to the plate and racked up six hits, scoring five runs. After tying the score at two, Adrian Del Castillo launched three-run homer over the right field wall. The five-run fifth was the fourth time this season a Virginia opponent scored five or more runs in an inning. The five-run third inning was part of eight-straight runs scored by the Hurricanes. The three-runs with two outs in the top of the sixth made the score 8-2, the largest lead of the afternoon. Weiller ignited the Cavalier comeback effort in the bottom of the sixth with an RBI double that scored Gelof. The next batter, Logan Michaels (DeForest, Wis.), brought Weiller home with an RBI single up the middle to cut the Miami lead in half, 8-4. Weiller was 2-for-4 with a run scored and two RBI in game one. It marked his first multi-hit effort of the season. Virginia pulled within two thanks to an unearned run and then a sac fly from Gelof in the seventh. Zack Gelof (Cape Henlopen). went 3-for-3 with two runs scored and an RBI. It marked the fourth time with three or more hits in a game this season for Gelof. Besides the five-run third, Virginia starting pitcher Noah Murdock (Colonial Heights, Va.) kept the Miami hitters at bay. Six of the nine hits he surrendered came in the fateful third as he worked into the sixth inning for the seventh time this season. Chesdin Harrington (Montpelier, Va.) made his 13th appearance, recording the final five outs for the game. His 28.1 innings pitched out of the bullpen this season, lead all Cavaliers. Virginia starting pitcher, Griff McGarry (Portola Valley, Calif.), turned in his fourth quality start of the season and was the tough luck loser in game two pitcher's duel. McGarry allowed two runs over 6.2 innings of work and struck out seven batters while walking only two. It marked the fourth time this season the right-hander has struck out seven or more in a game. Miami broke the scoreless tie with a two-out double off the bat of Tony Jenkins that scored Del Castillo from second base. The Hurricanes struck again with two outs, in what proved to be the game-winning run in the sixth. Third baseman Raymond Gil cracked his ninth homer of the year over the left field wall to put Miami up 2-0. The Cavaliers got on the board in the seventh with an RBI groundout from Brendan Rivoli (Douglassville, Pa.) that scored Alex Tappen (Lower Gwynedd, Pa.). The RBI for Rivoli was his 24th of the year. The Cavaliers left the tying run on base in the frame and did not record a hit for the remaining three innings. Miami starting pitcher, Chris McMahon, limited the Cavaliers to just two hits over 4.2 innings pitched before exiting with an injury. Relievers Baily Mantilla, Mark Mixon and Greg Veliz combined to toss 4.1 innings of one-hit relief. Veliz recorded his fourth save of the season, allowing one runner over two innings. Cavalier lefty Andrew Abbott (Halifax, Va.) was just as good in relief, allowing no runs over the final 2.1 innings. He stranded a runner in scoring position in each of the three innings he pitched including a runner on second that he inherited in the seventh. • Miami has won five-straight games against Virginia, tied for its longest win streak against the Cavaliers. • Saturday's doubleheader was the fifth of the season for Virginia, fourth at Disharoon Park. The Cavaliers own a 5-5 mark in doubleheaders in 2019. • In game one, Tanner Morris (Crozet, Va.) recorded his 19th double of the season. He came into the weekend tied for the most doubles in the country. • Simmons has reached base in 21-straight games with a walk in each game of the doubleheader.